Be the first to hear about their new releases and deals. Download the Booksprout app and search for Elisa Guajardo Carothers today! Elisa Guajardo Carothers is an Adrian Michigan born native. Upon wedding her spouse James she moved to Fayette Ohio. The couple now reside in Port Richey FL. 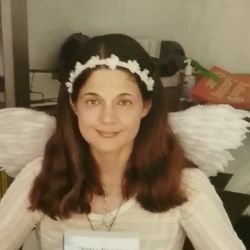 Elisa has long been fascinated by Angel Lore and the Bible. The author hopes her narrative will inspire readers in their own spiritual beliefs. In her extra time Elisa enjoys acting and attending Beth El Shalom a Messianic Jewish congregation. She also loves to explore the various beaches and boardwalks in Florida.